This External Rechargeable Lithium Ion Battery Pack is compatible with Macbook, Macbook Air and Macbook Pro computers. 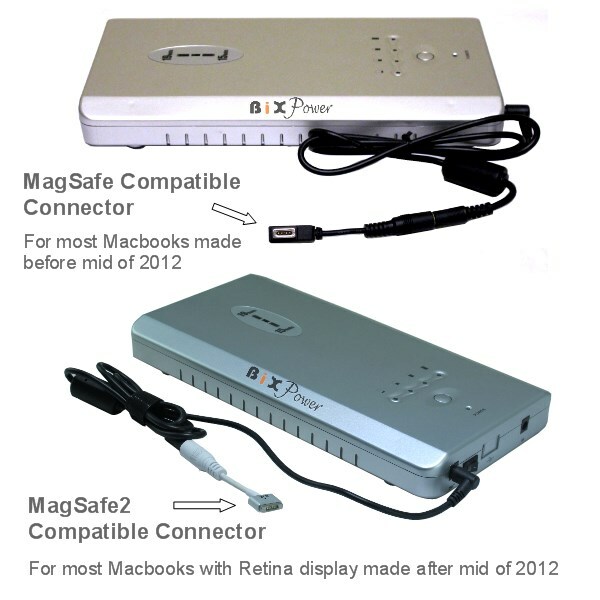 This battery is actually same battery as BiXPower BP220 battery, but it only comes with special connectors for apple Macbook computers. It does not come with other connector tips. If you also need to use this battery for other computers, you may just order some extra C series connector tips with the battery. Size: 10.6" x 5.8" x 1.3"
1. Charge the battery: This battery has it own battery charger, you can charge it from any 110V or 220V AC power source with the included AC charger. 2. Set right output voltage: After the battery has been fully charged, set the voltage output of the battery close to your notebook DC power input requirement (which is same as your notebook AC power adapter's DC output voltage). This battery has a switch to set the voltage output at 15V or 19V. 15V is compatible with computers that come with 14V~16.5V power adapters. 19V is compatible with computers that come with 18V~21V power adapters. 3. Turn on the battery & Connect the External Battery Pack to your notebook DC power input jack (which is the same jack your notebook AC power adapter usually plugs into). Now you can power your notebook from this External Battery Pack . CAUTION: Always turn off the battery when you do not use the battery. 1. The output voltage of two batteries is set at same. 2. Any single battery has ability to power the powered device by itself. 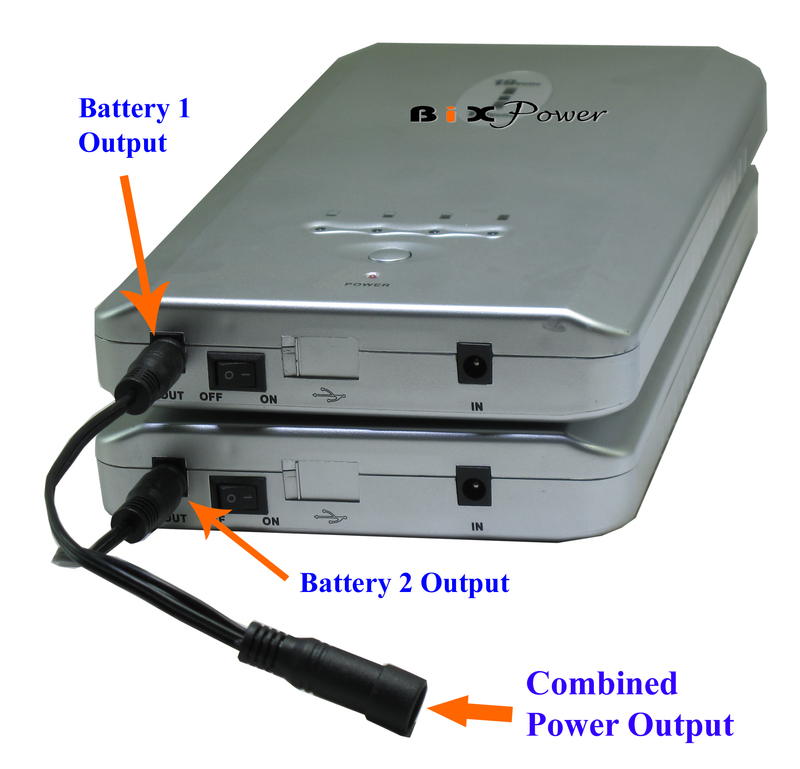 The purpose of link two or more batteries together is to provide longer running time without interruption. There this no balance control between two batteries . One battery may output more power than another battery and run out of power earlier than another battery. This will not be a problem if a single battery output power is enough to run powered device. However, if the powered device power demand is more than a single battery capability, it may run to problem when one battery run out of power earlier. 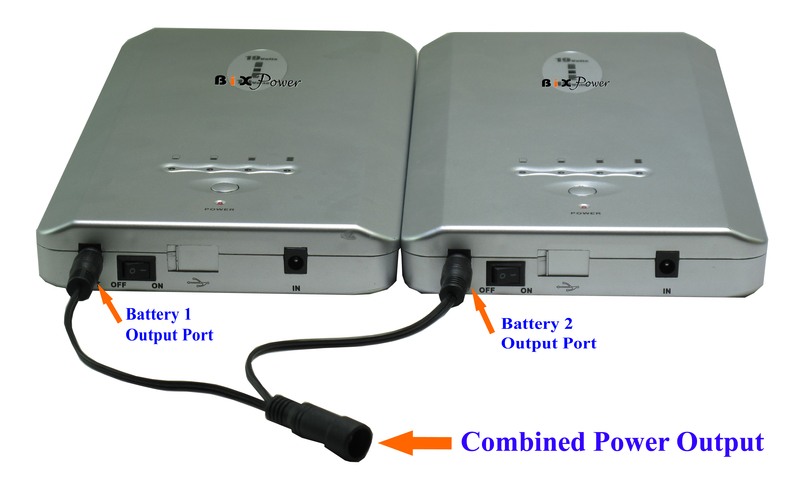 Notes: Only a few BiXPower batteries ( such as BP90, BP100, BP160 and BP220 batteries) have been specially designed to allow multi batteries to connect in this way. Other batteries may not be allowed to be connected together in this way (unless specially mentioned). You may also use multi Y25 Split Connectors to Daisy Chain more batteries to provide even more power. Please make sure all batteries output voltages are set at same. Fully charge each battery separately before connect them together. The battery regular Z6 output cable can fit Y25 connector female end, which will be combined output port in this case. You may use BiXPower Special Cable with On/Off Switch : which can be used power output cable directly without battery regular Z6 output cable.